So I have the new validator ready for testing for DNA@Home. I'm just waiting on the last of the work units that got sent out on DNA@Home to return and get validated before I shut everything off over there and start the validator on citizen science grid. Or, would people rather prefer I just shut down the daemons over at DNA@Home so we can get things working over here sooner (there are about 300 tasks still out in the wild over there that are a couple days old now)? Unfortuantely, there's no good way to run both at the same time. I have no problem either way, do what you think is best for your project. I'm fine with shutting it down on DNA@Home and firing it up here. Message 3077 - Posted: 13 Aug 2014, 22:49:36 UTC - in response to Message 3075. Okay, I'm going to shut down those daemons in about 2-3 hours (after I get back from running some errands). I posted a news message on the old DNA@Home forums. Message 3078 - Posted: 13 Aug 2014, 22:50:16 UTC - in response to Message 3075. Yes start validator on CSG. Fine with me if you shut down the old one. I only have 5 tasks pending there which is immaterial. Are you intending to transfer the existing DNA@Home credit over to CSG after you shut it down? 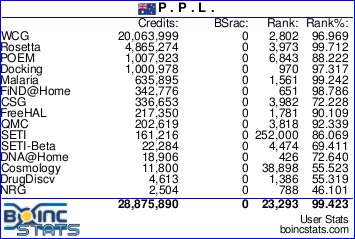 Currently my CSG account on BOINC is only showing 636 credits, 370 "phantom" credits I received on Wildlife @Home when you were testing the validator and another 266 credits which have just appeared but I don't know where from. Possibly more DNA tasks that have been validated but are not showing up as validated yet. Message 3080 - Posted: 13 Aug 2014, 22:55:20 UTC - in response to Message 3079. Are you intending to transfer the existing DNA@Home credit over to CSG after you shut it down? Currently my CSG account on BOINC is only showing the 370 "phantom" credits I received on Wildlife @Home when you were testing the validator. I'll run my "fixer" script one last time after I shut down the DNA@Home daemons. That copies the any extra credit over from DNA@Home that might have been gained after you linked your accounts. Your CSG account should show credit equal to the sum of your credit on all sub projects. I'll look into seeing why that isn't the case. Yes my CSG account on the CSG website shows the total of all 3 subprojects, but my CSG project in BOINC Manager is only showing the 636 credits I mentioned in my previous post edit. If you shut down those old DNA and SubsetSum servers, won't the credit there disappear from the stats sites unless you transfer it to the new unified CSG project? Message 3083 - Posted: 14 Aug 2014, 0:57:04 UTC - in response to Message 3081. I can still export the stats for DNA and Subset@Home (and Wildlife@Home) to the same old places from a custom stats exporter. So BOINC Manager will show a total for the CSG project but the CSG project itself will not show up on the stats sites only the individual subprojects. Is that right? Currently my BOINC Manager CSG project is showing the total of the "phantom" Wildlife@Home credit, future DNA@Home credit will need to show up there too. Therefore CSG project in BOINC Manager will show total of all Wildlife, DNA and SubsetSum credit from now on. And the total shown by the stats sites for the 3 separately listed subprojects minus the last credit total exported from the old Wildlife, DNA and SubsetSum sites will equal the BOINC Manager CSG project total. Hope I've got it right, it's a bit complicated for me to understand as it's different to how other projects show credit. 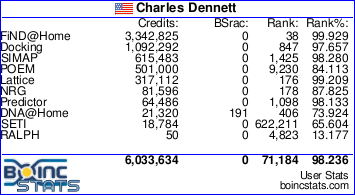 Usually the total shown in BOINC Manager for a project is the same as that shown by the stats sites. Some projects export subproject stats as well as the project total and this is shown by stats sites like Free-DC, but not BOINCstats. The reason I was confused was because I thought you were going to import the old subproject stats into a new CSG unified total so that BOINC Manager and the stats sites would agree on the CSG total. But if subprojects are still going to have stats exported separately as though they are still 3 totally separate projects, well that seems a bit messy when BOINC Manager is treating them as only a single project but hope it works out. Message 3086 - Posted: 14 Aug 2014, 3:07:05 UTC - in response to Message 3085. Well thats going to depend on how the stats sites want to handle things. CSG combined credit totals will be available, along with the sub project totals as well. But the BOINC manager will show a total for CSG. Thank you for deciding to import all my old credit from DNA and SubsetSum and adding it to the new CSG project total as shown by BOINC Manager..
A single main project total that matches what is shown in BOINC Manager is something I can understand as it is the same as some other BOINC projects that have subprojects. Great work and all my pending DNA tasks validated too, excellent.